Haven't flushed your cars cooling system in awhile? Here's a brief how for Coolant flush and radiator drain. The plug is on the BOTTOM of the radiator(see fig.A), on the passenger side. Jack up car and you will see only one opportunity for a 10mm hex. DISCLAIMER: PLEASE DO PROCEDURE ON COLD OR WELL COOLED DOWN CAR, PREVENTS BURNS FROM HOT COOLANT!!! Also drain and clean the coolant reservoir. While draining the radiator take the time to clean it, and have it ready with fresh fluid. Super easy to take off...2 bolts 10/12mm I believe, disconnect hose attached. Step 2: Once old fluid is out, get gallon or 2 of distilled water(depending on how many flushes you do) and pour into radiator fill cap from top of. Please make sure drain plug is closed. 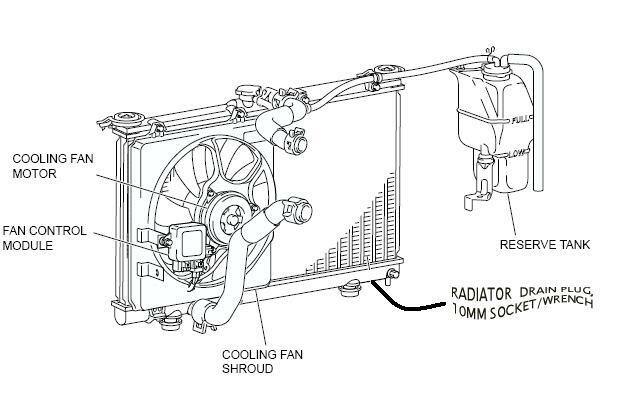 While filling the radiator you should run the motor and crank the A/C on Heat; max temp. Continue pouring till radiator is full. Step 3: Drain radiator again which should have a slight mix of left over coolant and majority distilled water. If you feel you got all the old fluid out then continue to step 4, if not repeat from Step 2. Step 4: Radiator should be fully drained of the distilled water, time to fill up the car with your preferred mix of coolant to water. Depending on what climate you live in, you can play with the mix of coolant : water. Drain plug for radiator should be closed and tightened. Remove drain pan, and lower car to level ground. Step 5: DO NOT FORGET TO FILL RADIATOR. Do it with the car on the ground and also refill Reservoir Tank. MAKE SURE TO CHECK FOR LEAKS BEFORE DRIVING OFF!!! Step 6: BURP system after filling radiator and reservoir. start car and let engine idle. It may take a few minutes at idle for the air pocket to find it's way out. Initially the fluid will pulse and then start to pour over the fill neck. Once you're satisfied, replace lost coolant and clean up mess. Side Note: Make sure you are Checking your radiator fans for proper operation. If you have evoscan you conduct a quick fan test to make sure they are operational. I had one of my fans go out on me and didnt know it. Last edited by Evoryder; Sep 21, 2012 at 04:36 PM. Does the undercarriage crap need to removed to get to the drain plug? ^ Yes...good ol' plastic screws, have fun : ) ...i keep undershield off. as do I, great job bro. 1. I noticed you drained everything whilst the car was jacked up (i.e. it was not level). You don't need to drain it level, by running the distilled water through it will allow you to get the old fluid out. Second question: You can do so if you want, but I don't believe it's necessary. Nice write up!! Need to do one soon. What types of mixes are people running? Does water work the best? I was thinking some water wetter until it starts getting nippy out. Do you mean 70/30 water/coolant? Make sure u get all of the air pockets out. If not under pressure u can pop a freeze plug. FYI! Bringing the thread back alive. So about how much of each item would give you 60/40 is it 2 jugs coolant and 1 gal distilled water?